The first thing you need to do after a weekend of too much is to get your heart pumping and your body moving. I find the easiest way to get this started is by going to workout first thing Monday morning. By immediately starting my week with a healthy behavior, I set the tone for the rest of the day and week. If working out in the morning is not your thing, don't worry about it. Just make sure you get in some type of high-intensity cardio on that first day. I find that when I do not workout first thing on Monday, it is much easier to make excuses to skip throughout the week. But when I do get that sweat session in I want to keep up the routine and not break the pattern. This one is the hardest for me. I am a girl that loves her after work "happy hour" even when it is just at home. But, we are wanting to cut out all negative calories for the time being to make up for the excess over the weekend. One of the easiest way to do that is by cutting out alcohol. Since I love the ritual of happy hour more than the actual drinks, I like to make "mocktails" when I am cutting back. One of my favorite mocktails is an alcohol free "Salty Dog": Topo-Chico (sparkling water) with a splash of lime juice and fresh grape fruit juice. Put it in a fun glass and you won't even know that the alcohol is missing. Plus you won't feel deprived. Cut out anything that has "added sugar" in it. This will eliminate almost all packaged foods and force you to shop around the perimeter of the grocery store. Processed foods tend to be found in the middle aisles. I continue to eat things with natural sugars like fruit, but toss out baked goods, packaged sauces/ dressings, and of course, candy. I have a sweet tooth and I love dessert so this can be a challenge, but like the mocktails, I think it is the ritual I love. So for dessert at night I will have some fresh strawberries or raspberries. While not as good as a Snickers, I still feel like I am getting a treat! It is much easier to control your portion size and what goes into your food when you are at home. Plus, sometimes when you eat out, you feel like you HAVE to eat everything on your plate because you paid for it. At home, it is easy to store uneaten food and get it out of sight and mind. If you do have to eat out plan ahead. Look up the restaurant's menu online and make your food selection before you arrive. If you have a game plan and you are prepared it will be much easier to say no to tempting items that do not follow your "get back on track" plan. Even with a morning workout, you need to keep moving. My job is 100% sedentary. I am not burning any extra calories by sitting in front of my desktop. After a weekend of eating and drinking, I especially know I need to get in extra steps. Some easy ways to do this are: walk to tell someone something instead of emailing them, go for a walk around your building during lunch, add an extra block to your dog's morning and evening walks, and/or go for a walk after dinner. This added physical activity will do wonders for your mental health too! All of these steps are easy fixes that won't drastically change your everyday life. Yet, they will make you feel fitter and healthier after a weekend of "too much." 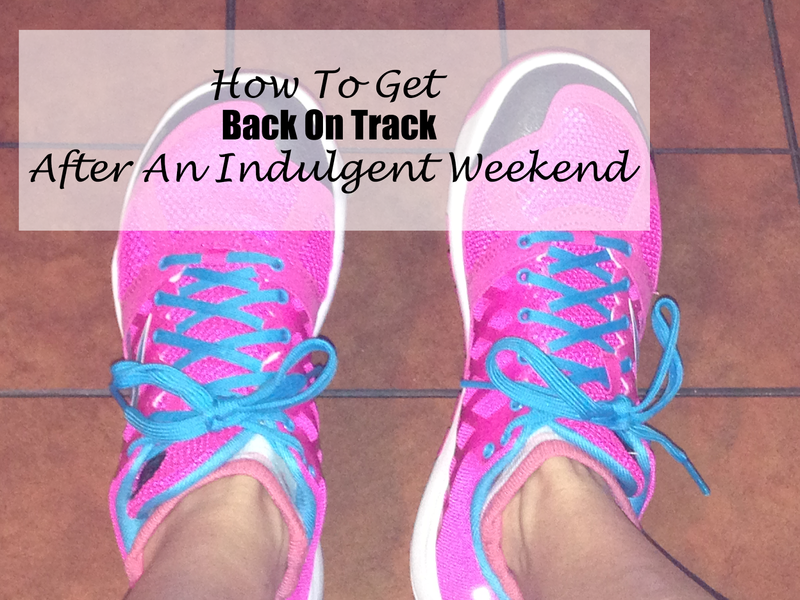 For the next few weeks I have fun things lined up on the weekends and know that I will likely over indulge too. When that happens, I will be ready to get back on track and implement these easy tricks into my week. What is your favorite way to get back into a healthy routine?